How it all started for me? Well, I'm not sure of how it really started, but I know what hit me first: kpop! But as you can guess (because here I'm now, right?) I could not flee from my fate. At that time, I just got into some Hyuna and SNDS's songs, but time leaded me to drown more and more into Korean entertainment gradually. Yes, I'm a drama addicted, we all get it. Now, what are my favorite dramas? Let's see..
Yeeees, my first drama, my first love, my first oppas, the first place in my heart. With Dream High I discovered Suzy and IU (my ultimates), 2PM and Kim Soo Hyun ♥ oh boy, I luv this drama. Four boys in a band, what could go wrong? Wait, three boys and a girl? Three boys and a NUN, who's dressed like a boy? COOL! This was on netflix by the time I watched, it was my second drama and I loved it! Oh my Jung Yong Hwa, I'm sooo glad I found him at my second drama! Third drama in my life, third favorite, this is getting a little obvious, isn't it? But this is the last, from now on it will be out of order. I just followed Shin Hye and Yong Hwa from "You're Beautiful" and ended up with another favorite. One of my favorite couples on dramas, and one real shipp, YONGSHIN IS REAL (but you don't have to believe me, this is just one wish that I try to believe)!! Here's Shin Hye again, in another drama with Kang Min Hyuk, and plus Lee Min Ho!!! Yes, it was my first drama with Lee Min Ho, and yes, I fell in love with him (I'm easy like that, hahahaaa). And at last, but not least, Kim Woo Bin! He's so attractive, dammit! I was following Shin Hye again and I discovered Lee Jong Suk, an incredibly good looking guy who's also an amazing actor. I also discovered that I'm going to follow Shin Hye forever, I can't help falling in love with every single drama she's in, ooooh girl! This is the last drama that I added to my favs list, and it couldn't be different. 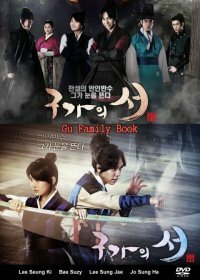 It's an amazing drama, with an awesome cast. I strongly recommend it!